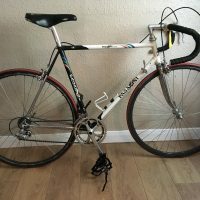 Do you want to Buy / Sell /Swap vintage bike parts? If so why not post a Classified Ad, we provide this service free of charge to our visitors. Category: All Categories WantedComplete Bikes / FramesComponents- Brakes- Chainsets / Gears / Pedals- Handlebars / Stems / Seatposts / Saddles- Other Components- Wheels / Rims / HubsClothing- Cycling Jerseys- Cycling Shoes- OtherAll other stuff ! Moser San Cristobal. 57cms (23") c/c. Fully pantographed vintage 1980's Moser San Cristobal. 57cms (23") c/c. Suitable for L'Eroica. OldVelos © 2019. All Rights Reserved.